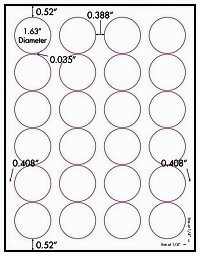 1-5/8" Diameter For use in Inkjet Printers ONLY! Material: White Photo Glossy INKJET ONLY! Photo Quality Glossy Round Labels for Inkjet Printers only! You will get spectacular images which can be applied to a variety items. Avery® labels are manufactured by Avery Corporation. Avery is a protected trademark of that company. Label Outfitters® does not make Avery products.